Bagheera Coffeeshop is a small establishment found in the Nieuwmarktbuurt, the area surrounding Neuwmarkt (“New Market”) Square. It sits just to the south of the square, along the Kloveniersburgwal canal. The shop gets its name from Bagheera, the black Indian leopard from the famous children’s novel The Jungle Book. An interpretation of this character is found in the logo, which depicts the image of a teeth-baring Black Panther. 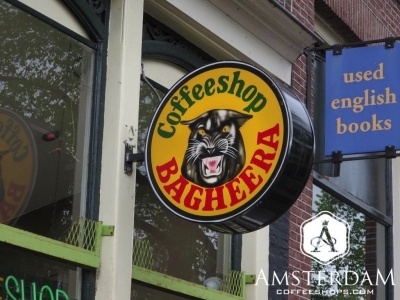 In contrast to the aggressive tone of its logo, Bagheera Coffeeshop has a relaxing and welcoming vibe. The front room would be best described as having the appearance of a small café or juice bar. 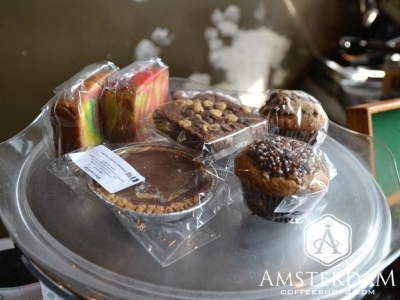 It is clean, well lit, and hosts a counter for ordering drinks and fresh smoothies, as well as cannabis products. You will probably notice a lot of fresh fruit like oranges and bananas here. There are a couple of seats near the front window, and for those who prefer al fresco, there are some tables out front. This is a great place to sit and smoke if you enjoy people watching, as this area of the city is trafficked heavily. 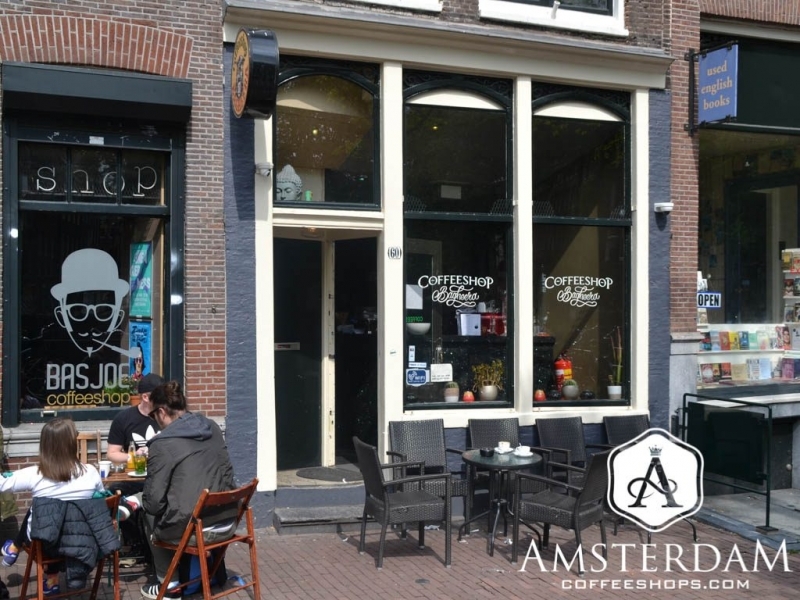 Further on into Bagheera Coffeeshop you will find a closed smoking room, which allows mixed cannabis/tobacco smoking on the premises. 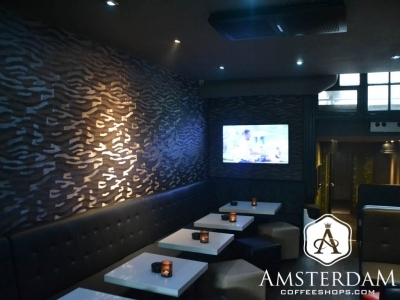 The inside décor is very reminiscent of a modern café. 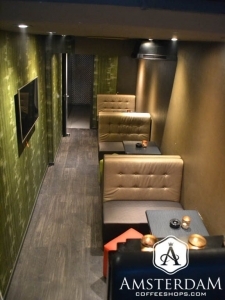 Long leather bench seating lines the walls, and in front, small white mica tables. Pull up small leather stools are found on the other side of the tables. The seating, walls, and floors in this room are largely gray, contrasted with splashes of lime green as the accent color. There are a couple of flat screen televisions mounted on the walls for anyone needing visual entertainment. 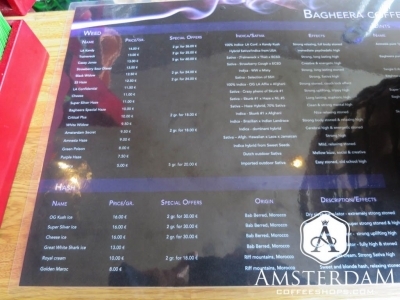 The cannabis menu at Bagheera is fairly large. There are more than a dozen different strains of weed. These is a fairly even mix of old-school favorites (think White Widow, Amnesia) and more contemporary strains. There is also about half a dozen types of hashish. These are generally imported varieties, mainly from Bab Berred and the Riff mountains of Morocco. From time to time, you will also find higher potency “ice-o-lator” varieties on the menu. 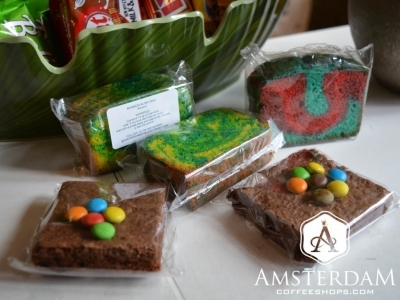 Bagheera Coffeeshop also serves space cakes, marijuana infused tea, and pre-rolled joints. The pricing ranges from the “quite reasonable” to “consistent with city center.” Additionally, this shop offers free Wi-Fi for its visitors, and a Volcano vaporizer. Coffee carino con personale valido!!! After a disappointing bag of Jack Herer at Hunters Rembrandtplein I was pleased to walk the 5-10 mins to Coffeeshop Bagheera. I explained to the budtender about my disappointing purchase earlier and asked for something to get me really stoned. Lazy stoned. I told her I have a very high tolerance and she offered three different strains. I settled on a couple of grams of Rolex OG at €16 per gram. More than I’d usually pay, but it looked and smelt good, and I trusted her recommendation. I took a drink, tipped them, and went and sat by myself at the very far table in the lower section. A few minutes later and on my first toke I knew I’d got something far more superior to my previous deal. Mood improved immediately, and I smoked a couple of joints at a leisurely pace. Other groups cleared their tables and I was left to myself in the lower section. The same female BT came and cleared tables in preparation for closing, but stressed it was no problem for me to stay where I was. We then had a good laugh about other groups that had come in and used chairs and tables that were clearly closed off. Overall friendly and helpful. Will try and make it back on this trip, but if not this time definitely in the future.